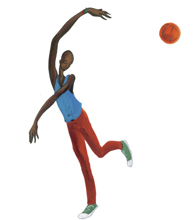 Starred review "Basketball and imagination soar in a game of one-upmanship; H.O.R.S.E., or Ghost, as it is also known, is described as "an anything-you-can-do-I-can-do-better contest." Myers and narrator Dion Graham team up to read this original, funny, and entertaining book. Their playful banter incorporates drama and humor as they try to best each other by describing one amazing, outrageous basketball feat after another. Listeners will be thoroughly engaged and waiting intently for the next crazy shot. Sound effects include a basketball swooshing into a net and a jet passing overhead. The game of H.O.R.S.E. is further explained at the end of the book as Myers shares his childhood memories of playing the game with his friends and families. He stresses the reliance on verbal skills, imagination, and the equal playing field nature of the game in which no one has any particular advantage over anyone else. VERDICT This outstanding set will appeal to basketball fans, boys, girls, parents, and teachers." Starred Review "It’s not often that a recorded version of a picture book is as much fun to listen to without the book as it is when following along page by page. Here’s one that fits that description, and then some. From the opening lines—when two friendly rivals talk over each other, disputing what the page-turn signal is supposed to sound like—listeners will know they’re in for a performance that captures not only the words but also the spirit of a tale that revolves around bragging rights to the best basketball shot (real or imagined) in the history of the world. The jazzy, rhythmic background music echoes the sound of a ball as it’s dribbled across a court, while the two narrators spar verbally: joking, jiving, and laughing as they pile improbability on top of exaggeration on top of the utterly impossible. Add the Coretta Scott King Honor Award Book to it, with Myers’ wonderful illustrations, and you’ve got an outstanding package, any way you listen to it."